The establishment of the Video Cognition team came from the November 2011 acquisition of a firm VideoSurf, which created a technology that catalogued and tagged videos by scanning audio and visual content of videos. The VideoSurf app allowed users to point their camera at a television to analyze the show they were currently watching for additional information and suggestions, leading many to deem the app "Shazam for video." A profile of the Video Cognition team on Microsoft's career portal hints at how the VideoSurf tech will be applied to the Xbox platform. One Video Cognition engineer reveals that the team's aims are "to radically change the way we watch TV," and to leverage advances in gestural and voice control to "streamline the way viewers search, consume, and share content, minimizing the time spent searching for programs, while maximizing the viewing and sharing capacities." Additionally, a recent job posting described Video Cognition as "one of the most strategic assets at Microsoft," and the team is "building scalable services that enable magic scenarios for tens of millions of users worldwide." This could possibly suggest that the new Xbox will somehow integrate television content in a more meaningful manner (Netflix/TiVo-esque recommendations based on content analysis, maybe? ), and perhaps lend credence to the constant rumors that Microsoft's vision is a bit more broad than a mere games machine. Late last year, The Verge's Microsoft specialist, Tom Warren, relayed a rumor that the Redmond giant was actually pursuing a two-SKU strategy with the next Xbox: one model being a lower-cost set-top box and the other being an expensive full-fledged games console. This talk of an evolved Xbox TV integration could support or dismiss that report, though I think it is plausible that whatever innovative features the lower-end SKU might have will end up in the higher-end SKU. In his portfolio, one designer talks about his efforts in the long-term Xbox roadmap during a 10-month period at Microsoft's incubatory teams, saying that "Microsoft needs to reposition the Xbox to serve an audience beyond traditional gamers." There are also a couple of presentation images, two of which mention something called "xTV." One alludes to "xTV incubation" in the corner, and the other mentions "xTV" as part of a multiplatform ecosystem that will allow a user to finish a television episode they were previously watching on their train ride home. Interestingly, that "xTV" name does appear several times in the possibly-real Xbox strategy document that leaked last June. In that document, "XTV" (entirely capitalized) referred to a set of next-generation TV offerings, including a pay television service accessible via Xbox and other devices. 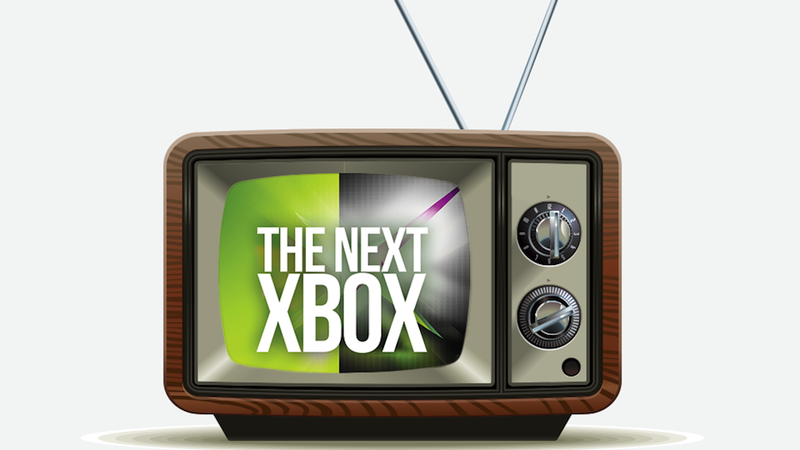 Earlier this week, Microsoft confirmed that the company sold off its Mediaroom IPTV unit to fully "focus on consumer TV strategy with Xbox," seemingly hinting that there is a more significant evolution for the Xbox brand's approach to television coming up. The notion of the next Xbox as a television device does give some intriguing context to the recent brouhaha over "always-on" technology. Your modern DVR set-top box is constantly connected to facilitate the steady stream of information being sent back and forth, so that you can power on and get whatever channel or services almost instantly. It also allows the device to know when to record a program that is on when you're away. In order for an Xbox to successfully work as a television device, it would need to have a constant connection. Also of note: A Microsoft manager who worked on the Xbox console until mid-2012 says the early prototyping efforts for the "next generation Xbox console" software had "a focus on a new, cloud-driven, voice optimized experience [that] pushed the boundaries of UI design and opened up a wide range of new scenarios." And Microsoft is currently "Prototyping for the next generation of Xbox SmartGlass." Several weeks ago, Insomniac Games filed a trademark registration for "Pop Riot" in relation to "game software" and "Entertainment services, namely, providing an on-line computer game." This registration comes a few weeks after the company filed a similarly mysterious registration for "Sunset Overdrive." An Volition audio designer's CV lists an "unannounced Next-Gen title" in addition to the already announced Saints Row IV. Curiously, he says he began work on this unannounced title at the same time he began work on the new Saints Row, which might lead one to wonder if this is some next-gen-oriented permutation of the next Saints Row title. There have been no announced next-gen SKUs for Saints Row IV. In recent interviews, the studio explained that they wouldn't be able to create a properly ambitious next-gen title if they had to wrap up development to meet system launch—an odd rationale given that many are wondering if the game is being rushed to beat Grand Theft Auto V to the market. It's also entirely possible, of course, that this next-gen title could be a different game. A job listing for a lead online programmer recently appeared on the jobs page of Heavy Rain studio Quantic Dream. The studio is requesting persons with a "very deep and high knowledge ofonline gaming / network developments." They are also looking for a candidate that has previously worked on a shipped multiplayer AAA title with significant experience in multiplayer gaming. Quantic Dream is known primarily as a producer of single-player dramatic games, and a multiplayer project would be a bit of a departure. Several years ago, in an interview, David Cage said online gaming was something he hoped to tackle soon, and he wanted to apply the same design philosophy of a game like Heavy Rain to "multiplayer experiences." Could we see some multiplayer in the firm's PS4 project? Finally, an agency job listing that matches the copy on Lionhead's recruitment page indicates that the RPG studio is working on a new title that is "part of a high profile, multi-million selling franchise." Although agency listings previously suggested that Lionhead's next project was a new IP, it is probably now another Fable game.